On this date in 1932, two Detroit gangsters, Sam and Andrew Farrera. 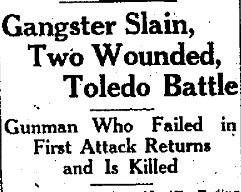 were doing some business in Toledo, Ohio when some local gangsters decided that they didn’t need any Motor City hoodlums muscling in. The Farreras, and another guy, were parked in their cousin's driveway when a car load of rivals pulled up and opened fire. The windshield of the Ferraras’ car shattered, sending glass into Sam’s eyes. His vision impaired, Sam managed to slip from the car and dive through a basement window. His brother caught a bullet in the hand. After the first barrage, the attackers pulled around the corner and one of them, John Incorvaia, alias Engoria, 33, jumped from the auto and returned to the house with an automatic pistol. Not bothering to knock, Incorvaia rushed into the house and opened fire. Moments later he dropped dead with two bullet wounds, one of which pierced his head. Mabel Candela, a cousin of the Ferreras, confessed to the shooting saying that she fired in self-defense.